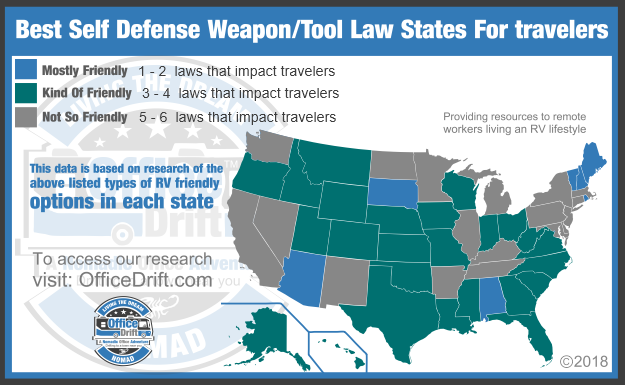 There are an increasing amount of law abiding citizens venturing into a travel lifestyle and inquiring about self defense and protection options. When it comes to legally owning a tool or weapon in one state, you may not think about if it’s illegal in another before passing through or even stopping for a while there. It’s important that your rights to bear arms and protect yourself are not infringed upon, however, it’s just as important for you to understand the laws that govern that right in each state you enter to avoid any unforeseen situations that could strip you of those rights. Where one state may deem a defense weapon/tool illegal, another may embrace it within their laws. This allows you the option to switch defensive weapons/tools prior to entering a state and securing/storing all unused weapons/tools in a fashion that meets the states guidelines. The list below is current up to the last time it was updated on Oct. 15th, 2018. If you notice a state law change before we do, please let us know so we can update this resource to keep it accurate faster. Be sure to check with a states official law documents prior to carrying/transporting any weapon/tool into their state. This is just a general guide to give you an idea of the laws and we are not affiliated with any of the state or government agencies that make those laws. Handgun -No Permit / No Registration / Open Carry / No Background / Out of state permits are ok, otherwise they must be locked up unloaded with ammo separate when traveling. Long Gun – Permit needed / No Registration / Open Carry / No Background / Out of state permits are ok, otherwise they must be locked up unloaded with ammo separate when traveling. Handgun -No Permit / No Registration / Open Carry / No Background / Out of state permits are ok, You may open or concealed carry without a permit. Long Gun – Permit needed / No Registration / Open Carry / No Background / Out of state permits are ok, You may open or concealed carry without a permit. Taser – No Permit / No Registration / Open Carry / No Background / May not be on your person while traveling. Knife – No Permit / No Registration / Open Carry / No Background / May not be on your person while traveling. Tire Thumper/Club/Baton – Permit Required / No Registration / Open Carry / No Background / May not be on your person while traveling. Handgun – Permit needed / No Registration / Open Carry in semi-rural counties / Background Check / Magazine limit 10 rounds / Out of state permits NOT recognized / Must be locked up unloaded with ammo separate when traveling. Long Gun – Permit needed / No Registration / Open Carry in semi-rural counties / Background Check / Magazine limit 10 rounds / Out of state permits NOT recognized / Must be locked up unloaded with ammo separate when traveling. Taser – No Permit / No Registration / Open Carry in semi-rural counties / Background / May not be on your person while traveling. Handgun – Permit needed / No Registration / Open Carry / Background Check / Some out of state permits allowed / Magazine limit 15 rounds / Must be locked up unloaded with ammo separate when traveling. Long Gun – No Permit / No Registration / Open Carry / Background Check / Some out of state permits allowed / Magazine limit 15 rounds / Must be locked up unloaded with ammo separate when traveling. Knife – Open Carry / Concealed Illegal / Switchblades illegal / Ballistic Knives are illegal / May not be on your person while traveling. Handgun – Permit needed / Registration Required / Open Carry / Background Check / Out of state permits NOT recognized / Magazine limit 10 rounds / Must be locked up unloaded with ammo separate when traveling. Long Gun – Permit needed / Registration Required / Restricted Carry / Background Check / Out of state permits NOT recognized / Magazine limit 10 rounds / Must be locked up unloaded with ammo separate when traveling. Taser – Permit Required / No Registration / Open Carry / Background / May not be on your person while traveling. Handgun – Permit needed / Registration Required / NO Open Carry / Background Check / Magazine limit 10 rounds / Out of state permits NOT recognized / Must be locked up unloaded with ammo separate when traveling. Long Gun – No Permit / Registration Required / NO Open Carry / Background Check / Magazine limit 10 rounds / Out of state permits NOT recognized / Must be locked up unloaded with ammo separate when traveling. Handgun – Permit needed / No Registration / NO Open Carry / No Background / Some out of state permits recognized / Must be locked up when traveling. Long Gun – No Permit / No Registration / NO Open Carry / No Background / Some out of state permits recognized / Must be locked up when traveling. Handgun – Permit needed / No Registration / Open Carry / No Background / Some out of state permits recognized / Must be locked up unloaded with ammo separate when traveling. Long Gun – No Permit / No Registration / Open Carry / No Background / Some out of state permits recognized / Must be locked up unloaded with ammo separate when traveling.. Handgun – Permit needed / Registration Required / Open Carry / Background Check / Magazine limit of 10 rounds / Some out of state permits recognized / Must be locked up unloaded with ammo separate when traveling. Long Gun – No Permit / Registration Required / Open Carry / Background Check / Some out of state permits recognized / Must be locked up unloaded with ammo separate when traveling.. Handgun – No Permit (Non-residents do need a permit to conceal) / No Registration / Open Carry / No Background / Some out of state permits recognized / Must be locked up unloaded with ammo separate when traveling. Handgun – Permit Required / No Registration / NO Open Carry / Background Check / NO out of state permits recognized / Must be locked up unloaded with ammo separate when traveling. Long Gun – Permit Required / No Registration / NO Open Carry / Background Check / NO out of state permits recognized / Must be locked up unloaded with ammo separate when traveling.. Handgun – Permit Required / No Registration / Open Carry / No Background / Out of state permits recognized / Must be locked up unloaded with ammo separate when traveling unless you have a concealed permit. Long Gun – No Permit / No Registration / Open Carry / No Background / Out of state permits recognized / Must be locked up unloaded with ammo separate when traveling unless you have a concealed permit. Handgun – Permit Required / No Registration / Open Carry / Background Check / Out of state permits recognized / Must be locked up unloaded with ammo separate when traveling unless you have a concealed permit. Handgun – Permit Required / No Registration / Open Carry / No Background / Out of state permits recognized / Must be locked up when traveling unless you have a concealed permit. Long Gun – No Permit / No Registration / Open Carry / No Background / Out of state permits recognized / Must be locked up when traveling unless you have a concealed permit. Mace/Pepper Spray – No Permit / No Registration / Open Carry / No Background / Restrictions (no more than 35 grams of CS [CS is the only tear gas accepted] or no more than 10% OC [different companies can sell different concentrations]), and no combinations of CS and OC. The list above is current up to the last time it was updated on Oct. 15th, 2018. If you notice a state law change before we do, please let us know so we can update this resource to keep it accurate faster. Be sure to check with a states official law documents prior to carrying/transporting any weapon/tool into their state. This is just a general guide to give you an idea of the laws and we are not affiliated with any of the state or government agencies that make those laws.